It’s All In the Name. Kobernusz. Alvin Kobernusz. Throughout the history of motorcycle drag racing, there have been a fair number of riders with names that reverberate with the thrill, excitement, and spine-tingling drama one would expect to find in such a power-hungry category, from the Sportsman level all the way up to the most perilous nitro-fueled bikes. Names like the legendary Frog Thacker, “The Michigan Madman” E.J. Potter, Larry “Spiderman” McBride, John “Pizza Man” Mafaro, Tracy “The Bad Apple” Kile, just to name a few. Then we have Alvin Kobernusz. The age old question, “What’s in a name?” really does apply here. Alvin’s somewhat quaint appellation belies the fact that when he’s not tending to his commercial grain farm in Manly, Iowa (Now THERE’s a fitting name) that specializes in corn and soybeans, he’s spending many a weekend astride his Nitro Harley-Davidson in the IHRA Nitro Jam Drag Racing Series—traveling the quarter-mile at elapsed times in the 6-second range at well over 200 miles-per-hour. 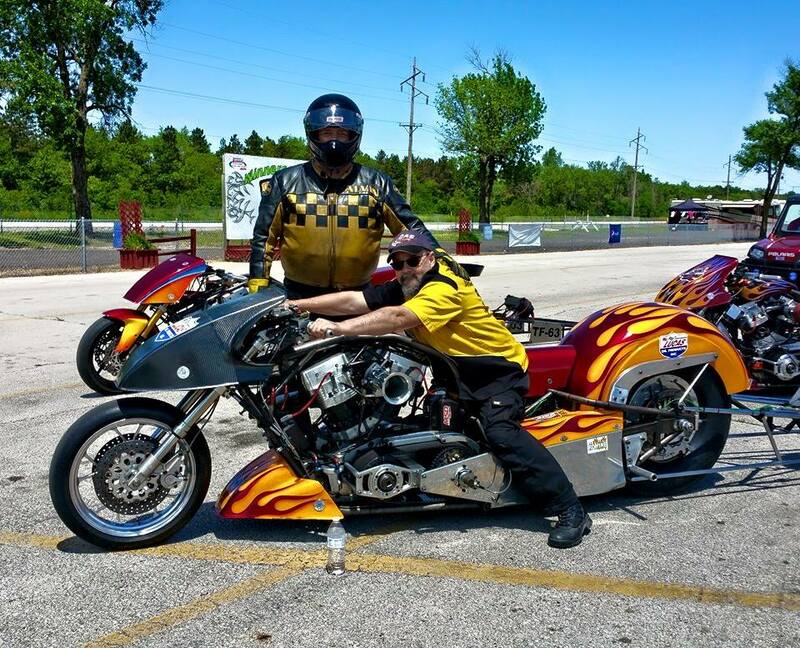 Alvin Kobernusz blasting off the starting line on his nitro Harley. At an age when most men of his vintage are ready to slow down and coast into retirement, Kobernusz reflects the energy and vitality of someone half his years. His eyes especially light up when asked what it’s like to wrestle a 1000-pound/1000-horsepower, two-wheeled she-devil down the dragstrip. 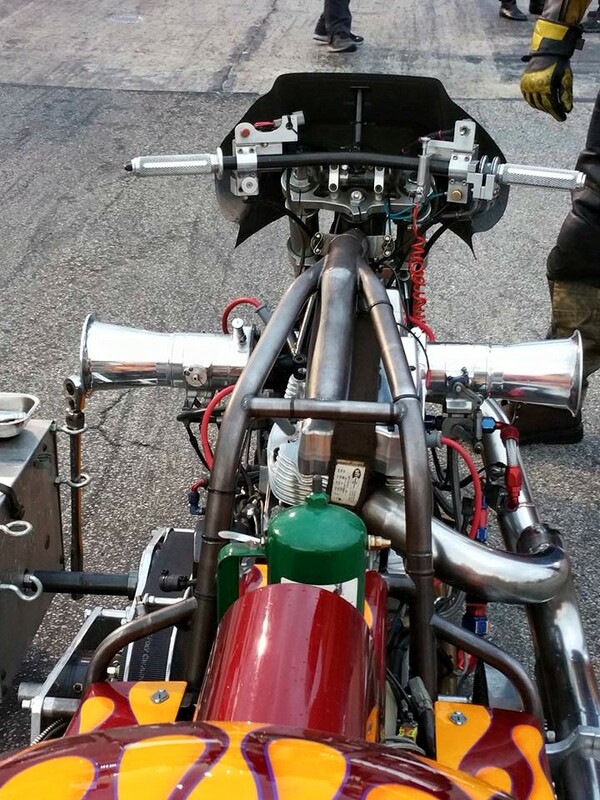 “The feeling is indescribable,” says Kobernusz while preparing to qualify for the recent IHRA Nitro Jam Summer Nationals in Cordova, IL, not far from Alvin’s Iowa farm. 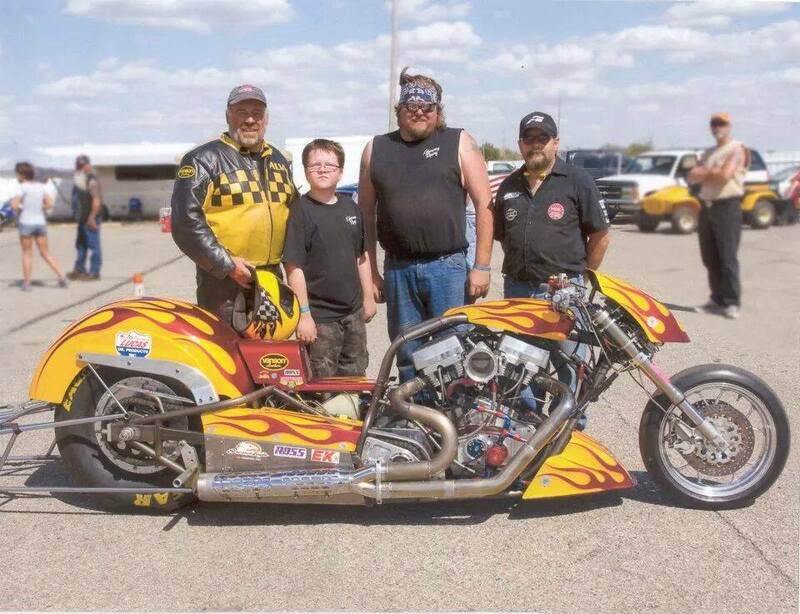 “The first time I saw and heard a Nitro Harley, I wanted to ride one,” said Alvin Kobernusz , pictured here with his crew. 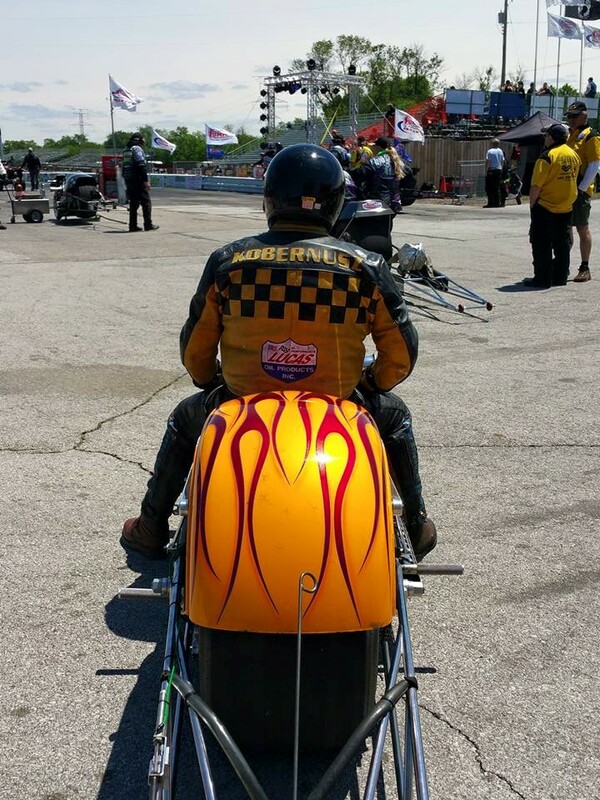 Kobernusz’s bright yellow machine wears the logo of Romine Racing, which frequently leads to people asking if he’s associated with longtime IHRA/NHRA Top Fuel and Funny Car veteran, Paul Romine. 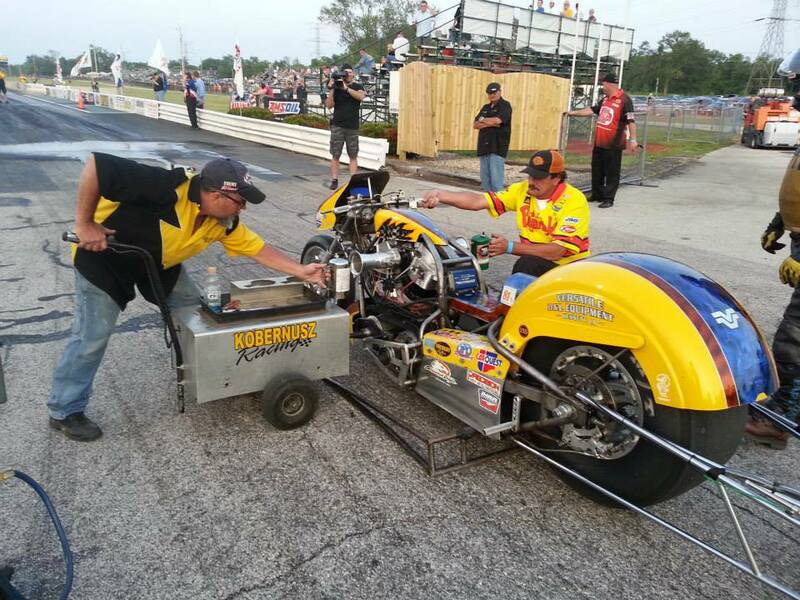 Nitro Harley legend Mike Romine helping to fire Alvin Kobernusz’s machine. 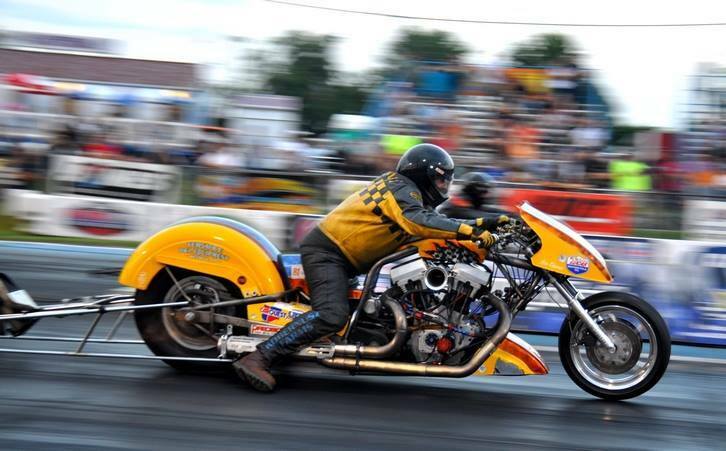 In case you’re not that familiar with the Nitro Harley class, these remarkable machines are brilliantly engineered, adopting downsized versions of much of the technology you’ll find in Top Fuel cars with close to 10,000 horsepower. Running as much as 98% nitro methane and sending all the power through two-speed gearboxes shifted by pre-set timers married to multi-disc clutches, the typical Nitro Harley travels the first 1000 feet of the dragstrip on the rear tire with the front wheel basically for display purposes only until it eventually regains contact with the track surface. 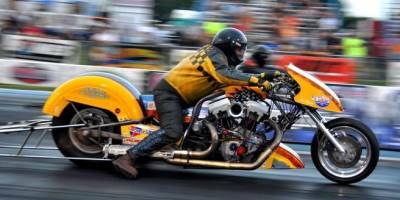 In case you’re not that familiar with the Nitro Harley class, these remarkable machines are brilliantly engineered, adopting downsized versions of much of the technology you’ll find in Top Fuel cars with close to 10,000 horsepower. The current IHRA national records are 6.250-seconds held by Joey Sternotti and 230.76 MPH set by Mark Cox. Alvin Kobernusz, “The Flyin’ Farmer” may not have the same mega-macho image that Lyle “The Axman” Newton or Jay “The Bulldog” Turner bring to the game but Alvin does prove that hunkering down on a 6-second fuel-burning Harley-Davidson takes a certain amount of courage, skill, and determination that separates the men from the boys. And besides, the bike doesn’t know what the rider’s name is. Nor does it care. Unfortunate that the author of this article didn’t mention ELMER TRETT, obviously you should do a little more research! Please see my response to Linda Wilson. You might also re-read the first sentence of the story. The premise of the feature is the creative and inventive names and nicknames motorcycle racers have worn over the years. If I were doing a story on the the Top Fuel Dragster racers who have also raced in Pro Stock, would you have taken me to task for not mentioning Big Daddy Don Garlits? I can assure you I do my homework and the necessary research when writing a story that will be read by the drag racing community. All I ask is that people read carefully and understand the thrust of the piece. Thanks. I can tell you this, Bill Stephens is one of the greatest drag racing historians in the world. It is an excellent article and as Bill explained, it’s no disrespect to the great Elmer Trett at all. So where exactly in this article, which I have read and reread, is the “creative and inventive names and nicknames etc. etc. etc.” that pertains to Alvin Kobernusz? Perhaps you need to follow your own “advice”. 1. A number of familiar racers in the motorcycle category have had evocative names over the years that reflect the excitement of where they compete. 2. However, Alvin Kobernusz doesn’t yet have a clever nickname like so many other racers. 3. Despite that, he has shown he doesn’t need a punchy nickname to prove he’s an accomplished Nitro Harley racer. I can’t put it any more clearly than that. I hope that resolves the issue. And thanks for the kind words, Jack! If it weren’t for Elmer, who by the way, just as Alvin, didn’t have any “catchphrase” associated with his name, we wouldn’t even be having this conversation…..have a great day! I really don’t want to throw nitro here, and the article is nice for Mr Kobernusz, and I’m not trying to take anything away from him, but to omit Elmer Trett sure made for a disappointing read. The author definitely needs to do his homework. For anyone that doesn’t know about Elmer Trett just look his name up on your computer! Thanks for your comment. I was at the US Nationals in Indianapolis in 1996 working for the NHRA when Elmer Trett lost his life (The same event where Top Fuel star Blaine Johnson was also killed). I’m quite familiar with his history and accomplishments. I’m sure most who read the story understood I was pointing out a number of motorcycle racers who had colorful names or nicknames, not making a list of the sport’s most successful competitors. I’m sure Elmer Trett is a great guy, But the article is about Alvin Kobernusz and rightly so. The man has paid his dues not only in racing but life as well. It is cliche but Alvin would give you the shirt off his back if you needed it. I’m very happy Alvin is having fun doing what he loves to do. I worked with Alvin for 8 years, he is awesome. Give em’ hell Alvin! You hit that right. I’m on alvins race crew, I have known him about 7 years now, he has become one of my best friends, so happy for him.